The new EZiCAT i750 provides a unique data capture and on board memory function, allowing verification of the locators use and the ability to recall records following a near miss, service strike or similar incident. Management are able to extract information such as time and date of use, user identification and detection mode used. In addition to this for the first time ever, GPS Positioning can now be tracked, providing the ‘Where’ in cable avoidance. Unlike the EZiCAT i700 the i750 enables operators to determine the depth of the buried utility, providing an advantage when conducting ground surveys. Provides the geographical position of use. Records and store information whilst in use. Includes the geographical position and survey findings. Wireless connection to download the memory log files and integrate into Survey Grade GIS systems. 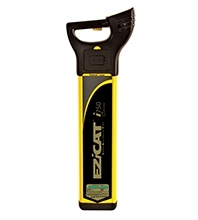 The EZiCAT i750 features utility depth indication, when used in conjunction with the EZiTEX or Sonde in 8 or 33 kHz modes. Operators can determine the depth of the buried utility, providing an advantage when conducting ground surveys. Making the EZiCAT easy to use, requiring minimal user training. All EZiCAT i-Series locators feature numeric signal strength readout, specifically designed for easy Sonde location and use with Signal generator. With built‐in light sensor, automatically enabling the backlight in dark conditions.